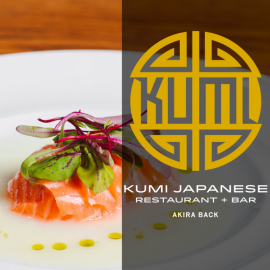 Kumi features Chef Akira Back's world famous cuisine – a modern Japanese menu with a Korean American twist. Born in Korea and raised in Colorado, Chef Akira Back has been named "Rising Star” by Restaurant Hospitality and "Best Chef in Las Vegas” by Las Vegas Weekly. The professional snowboarder- turned- chef has worked with top celebrity chefs including Masaharu Morimoto and Nobu Matsuhisa. Kumi is an inviting and engaging venue, featuring modern twists on authentic Japanese design. 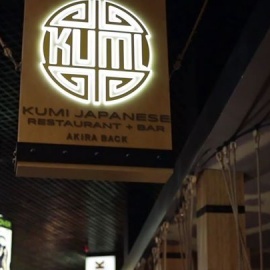 Kumi's 10,000 square feet of space offers various dining areas with seating for up to 300 people. The anchor of the dining room is Kumi's sushi bar, featuring glazed cobalt blue tiles in a scalloped pattern inspired by common Japanese homes. Adjacent to the sushi bar, a back rotunda with walls painted with giant interpretations of cherry blossom trees. Hakkasan Las Vegas is located in the MGM Grand Hotel. 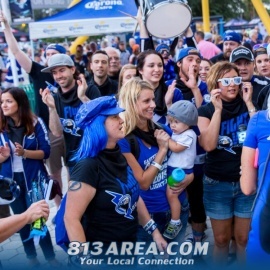 Enjoy sports games on 60 HD flat-screen TV's & celebrate some of the best moments in sports history with a vast collection of authentic sports memorabilia.